What difference can the Catholic identity of a school make to the way it approaches curriculum? How can the curriculum be ‘life-giving’ for students in the way Jesus intended when he promised ‘fullness of life’ for all? How can Religious Education, the Humanities, the Arts, Maths, Sciences and Technology, Health/ PE and Vocational Education be enriched by Catholic faith and life? How can all subjects work together to create an ‘ecology’ of learning that can help students discern wise life pathways? How can their years of learning the various subjects in school classrooms help them become a ‘leaven’ in the dough of society and a ‘light’ for the world? 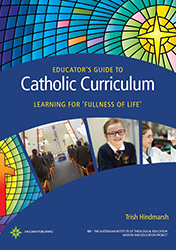 This Guide offers practical curriculum strategies and school-focused examples from educators in Catholic schools around Australia and New Zealand who are attempting to address these questions. The Mission and Education Project of BBI-TAITE (The Australian Institute of Theological Education) presents a series of Guides to serve the educational mission of Catholic schools in Australia and beyond. The Guides, each dealing with a specific area, introduce educators to ways in which mission and education may be integrated in the life and work of Catholic educators and students. The mandate given to the expert writers who create these Guides is to tap into the best available treatments of mission and also to ground their work in quality practice.